Bible verses indexed by subject, from The New Topical Textbook by R. A. Torrey. Jeremiah 7:9-10 Will ye steal, murder, and commit adultery, and swear falsely, and burn incense unto Baal, and walk after other gods whom ye know not; 10 And come and stand before me in this house, which is called by my name, and say, We are delivered to do all these abominations? Exodus 20:15 Thou shalt not steal. Mark 10:19 Thou knowest the commandments, Do not commit adultery, Do not kill, Do not steal, Do not bear false witness, Defraud not, Honour thy father and mother. Romans 13:9 For this, Thou shalt not commit adultery, Thou shalt not kill, Thou shalt not steal, Thou shalt not bear false witness, Thou shalt not covet; and if there be any other commandment, it is briefly comprehended in this saying, namely, Thou shalt love thy neighbour as thyself. From the poor specially forbidden. Proverbs 22:2 The rich and poor meet together: the LORD is the maker of them all. Leviticus 19:13 Thou shalt not defraud thy neighbour, neither rob him: the wages of him that is hired shall not abide with thee all night until the morning. Malachi 3:5 And I will come near to you to judgment; and I will be a swift witness against the sorcerers, and against the adulterers, and against false swearers, and against those that oppress the hireling in his wages, the widow, and the fatherless, and that turn aside the stranger from his right, and fear not me, saith the LORD of hosts. James 5:4 Behold, the hire of the labourers who have reaped down your fields, which is of you kept back by fraud, crieth: and the cries of them which have reaped are entered into the ears of the Lord of sabaoth. ⇒See THEFT in the International Standard Bible Encyclopedia. Matthew 15:20 These are the things which defile a man: but to eat with unwashen hands defileth not a man. ⇒See Theft in McClintock and Strong. Psalm 119:61 The bands of the wicked have robbed me: but I have not forgotten thy law. Store up the fruits of. Amos 3:10 For they know not to do right, saith the LORD, who store up violence and robbery in their palaces. Lie in wait to commit. Hosea 6:9 And as troops of robbers wait for a man, so the company of priests murder in the way by consent: for they commit lewdness. Commit, under shelter of the night. Job 24:14 The murderer rising with the light killeth the poor and needy, and in the night is as a thief. Obadiah 5 If thieves came to thee, if robbers by night, (how art thou cut off!) would they not have stolen till they had enough? if the grapegatherers came to thee, would they not leave some grapes? Consent to those who commit. Psalm 50:18 When thou sawest a thief, then thou consentedst with him, and hast been partaker with adulterers. Associate with those who commit. Isaiah 1:23 Thy princes are rebellious, and companions of thieves: every one loveth gifts, and followeth after rewards: they judge not the fatherless, neither doth the cause of the widow come unto them. May, for a season, prosper in. Job 12:6 The tabernacles of robbers prosper, and they that provoke God are secure; into whose hand God bringeth abundantly. Revelation 9:21 Neither repented they of their murders, nor of their sorceries, nor of their fornication, nor of their thefts. Proverbs 21:7 The robbery of the wicked shall destroy them; because they refuse to do judgment. Hosea 4:2 By swearing, and lying, and killing, and stealing, and committing adultery, they break out, and blood toucheth blood. Shame follows the detection of. Brings a curse on those who commit it. Hosea 4:2-3 By swearing, and lying, and killing, and stealing, and committing adultery, they break out, and blood toucheth blood. 3 Therefore shall the land mourn, and every one that dwelleth therein shall languish, with the beasts of the field, and with the fowls of heaven; yea, the fishes of the sea also shall be taken away. Brings the wrath of God upon those who commit it. Ezekiel 22:29 The people of the land have used oppression, and exercised robbery, and have vexed the poor and needy: yea, they have oppressed the stranger wrongfully. Ezekiel 22:31 Therefore have I poured out mine indignation upon them; I have consumed them with the fire of my wrath: their own way have I recompensed upon their heads, saith the Lord GOD. 1 Corinthians 6:10 Nor thieves, nor covetous, nor drunkards, nor revilers, nor extortioners, shall inherit the kingdom of God. Proverbs 29:24 Whoso is partner with a thief hateth his own soul: he heareth cursing, and bewrayeth it not. Shall be reproved of God. Psalm 50:21 These things hast thou done, and I kept silence; thou thoughtest that I was altogether such an one as thyself: but I will reprove thee, and set them in order before thine eyes. Ephesians 4:28 Let him that stole steal no more: but rather let him labour, working with his hands the thing which is good, that he may have to give to him that needeth. 1 Peter 4:15 But let none of you suffer as a murderer, or as a thief, or as an evildoer, or as a busybody in other men's matters. All earthly treasure exposed to. Luke 12:33 Sell that ye have, and give alms; provide yourselves bags which wax not old, a treasure in the heavens that faileth not, where no thief approacheth, neither moth corrupteth. Isaiah 10:2 To turn aside the needy from judgment, and to take away the right from the poor of my people, that widows may be their prey, and that they may rob the fatherless! Illustrates the guilt of false teachers. Jeremiah 23:30 Therefore, behold, I am against the prophets, saith the LORD, that steal my words every one from his neighbour. John 10:1 Verily, verily, I say unto you, He that entereth not by the door into the sheepfold, but climbeth up some other way, the same is a thief and a robber. John 10:8 All that ever came before me are thieves and robbers: but the sheep did not hear them. John 10:10 The thief cometh not, but for to steal, and to kill, and to destroy: I am come that they might have life, and that they might have it more abundantly. Genesis 31:19 And Laban went to shear his sheep: and Rachel had stolen the images that were her father's. Joshua 7:21 When I saw among the spoils a goodly Babylonish garment, and two hundred shekels of silver, and a wedge of gold of fifty shekels weight, then I coveted them, and took them; and, behold, they are hid in the earth in the midst of my tent, and the silver under it. Judges 9:25 And the men of Shechem set liers in wait for him in the top of the mountains, and they robbed all that came along that way by them: and it was told Abimelech. Judges 17:2 And he said unto his mother, The eleven hundred shekels of silver that were taken from thee, about which thou cursedst, and spakest of also in mine ears, behold, the silver is with me; I took it. And his mother said, Blessed be thou of the LORD, my son. SwordSearcher is a comprehensive Bible study package with over 100 valuable commentaries, topical guides, and dictionaries included, fully searchable and indexed by both topic and verse. Includes Torrey's Topical Textbook! Edited by R. A. Torrey, published 1897. 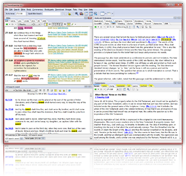 Source: Torrey book module from SwordSearcher Bible Study Software. All Bible quotations are from the King James Bible. Verse linking and popups powered by VerseClick™.